What on earth do they have in common? That was a question that I was hoping to answer. As I wrote last time, I'm working with an enrichment group for word study. Right now we're polishing up all of our skills to prepare for state testing. 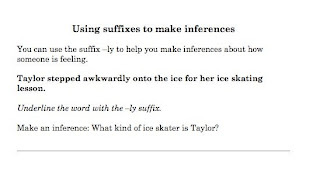 I need to review suffixes, but I also want to make the connection to meaning. Today I continued to read meta-fiction books. I shared one of my favorites--The Pencil, by Allan Ahlberg. Because I was working with suffixes, we made a list of the words with suffixes throughout the book. (I'd checked for these beforehand!) There were several -ly words, as well as some -ful words. After a quick discussion of the deeper questions of the book (Was the eraser bad, or just acting according to its nature? Why did everything want a name? Where did the illustrator hide a picture of the author? ), we looked into the words with suffixes. And this is where I have trouble with a lot of word work. So many of the worksheets and activities for using prefixes and suffixes are dead end activities. We look at the words, and take them apart, but never really use these words to their fullest potential. So I wondered--why are suffixes important to the reader? 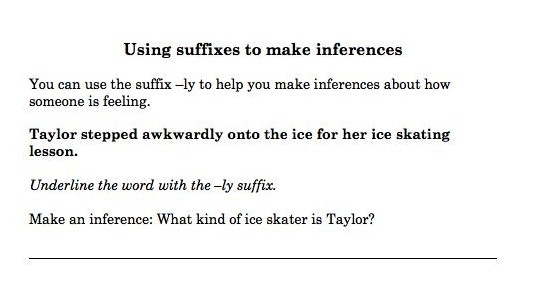 What can we learn from suffixes? Quite a lot, actually. I decided to focus first on the suffix -ly, mostly because it was well-represented in The Pencil (and also because I love to play the game In the Manner of the Adverb). In fiction, -ly adverbs are often very helpful for readers as they make inferences about a character's feelings in a certain situation. Learning to tune into these words as a source of information can be helpful for readers as they tackle more complex fiction. Think about this example: The one word awkwardly conveys a wealth of information about the character's feelings. A reader who doesn't attend to this word may miss the opportunity to make these inferences. So I made some short little scenarios with -ly words, which we'll talk about and act out. Just as more practice, I added another simple page. Hopefully it will be word work time well-spent! This year, my school has adopted an intervention period right after lunch. I love it! On three cycle days, I work with students who need help with fluency. On the other three cycle days, I work on word study with an enrichment group. The variety is so much fun and I feel like I can really go far with my groups. This week, I tried something new with my enrichment group. We're finishing up our work with prefixes, and I was trying to think of a literature link that would be enriching and interesting and appeal to my group's somewhat subversive sense of humor. But I had a deeper motive in mind. As I look at the next few months with my group, I wanted to set a new tone for our work together--something that goes beyond just test preparation and word work. Luckily, a student had just reorganized my picture book shelf this week, and I had rediscovered the Elephant and Piggie book We Are In A Book. So--what about metafiction? If you're not familiar with the term, click on the link above for a full explanation and a list of books that show metafiction. Basically, metafiction is just fiction about fiction--books in which the characters are aware that they're in a book. My group quickly grasped the concept, connecting it to episodes of Phineas and Ferb and The Name of This Book Is Secret (currently making its rounds around the room). But what about the prefix link? Well, I made a chart with the prefixes we had been working on--mis, dis, re, and un--and, as we read each page of We Are In A Book, we tried to think of words with prefixes that could describe the characters or events. It was a wonderful activity for this group. Working with their basic knowledge of prefixes, they worked to generate new words for each page. Some were obvious, like unhappy and reread. But other pages were hard. (It challenged me, too, which I always enjoy!) We talked about how some combinations of word plus prefix are generally accepted, but others are not. We also looked at how some words with prefixes have "lost" their base words--for example, repeat. But since the word repeat so clearly shows the meaning of "re", to do again, it should count as a word with a prefix. After we finished, students made their own little metafiction mini-comics, trying to use at least one word with a prefix. And they were hilarious! Even better, students were trying to use new and interesting words with prefixes. The idea of metafiction is incredibly appealing to the tween reader. Now that my students know the word, they feel like they are in on the secret. I casually set out The Stinky Cheese Man and it was read by 5 students in one afternoon--one even stayed in from recess to finish. :) And techniques of metafiction are blossoming in student journals. It's nice to have a fairly basic word study lesson become something much more interesting. Summarizing still amazes me. When you sit down and think about all of the skills that a reader must coordinate to summarize a text, it's amazing that readers can summarize at all. Readers have to understand the text, grasp the structure, distinguish important ideas from less important ones, and synthesize a new way to express the ideas in the text. For all its fascination, summarizing can also be frustrating. Ten years of teaching summarizing have shown me that there is no quick fix, no one flashy lesson that fixes all of the problems. This is why I feel so strongly that instruction in summarizing needs to be woven into all reading teaching. Activities like choosing the best summary, finding important ideas, or locating "seductive details" that drag the reader away from the main point are all quick ways to build summarizing skills all year long. With these activities behind us, I'm getting ready to dive into some deeper summarizing with students. As part of this, I've been thinking about assessing summarizing. One way to assess summarizing is to look at a student summary and count the number of important ideas that are included. (I wrote about this method in this blog post.) This is quick and especially good for younger writers. But this method doesn't assess the other aspects of a good summary, such as paraphrasing and following the structure of the text. To try to get at these aspects, I created this 6-point rubric. The basic structure of the rubric follows the rubric in Summarizing, Paraphrasing, and Retelling. Instead of just 4 points, though, this rubric includes 6. Important Ideas: A good summary should include the important ideas from the text. With this rubric, it's okay for a reader to include a few more details than strictly necessary. Paraphrasing: I like to be able to distinguish between summaries that attempt to paraphrase, but do so inaccurately, and summaries that just copy from the text. Structure of the Text: It's this component that led me to write the new rubric in the first place. On the one hand, a summary should reflect the structure of the text--within reason. I like to think of the television show "Lost" as an example of when a skillful summary might deviate from the structure of a text. If you were going to summarize that show--which I so do not recommend!--you would probably rearrange the ideas to make an easier chronology. In nonfiction text, sometimes authors play around with a structure for effect. Some rearrangement of ideas can help to make the summary more clear. In these cases, a highly skilled summary would not necessarily match the structure of the text. Word Choice: I added "academic language" to the rubric, because it's something that I want to start helping students work toward. I look forward to trying this out in the next few weeks...I'd love to hear your comments about it! In a perfect world, I'd be able to explore nonfiction text structures over the course of several weeks. But the real world of teaching is often far from perfect! This year, state testing is earlier than ever (thanks, PDE! ), which means that I have fewer instructional days to cram everything in. When teaching text structure, then, what can we safely skip over? My chest constricts a bit at the thought of skipping anything--it's all so important for young readers. But there are times when we need to take a few shortcuts. Choosing what to take out and what to keep becomes important. Given large amounts of time, I like to begin a text structure unit with an overview of the different structures. This helps students to see the relationships among the structures and put everything together into a cohesive whole. However, when time is short, it's okay to jump right in. I like to start with chronological order. Because it mirrors the structure of narratives, it's a good place to begin. As we go, then, we put together the pieces of the different structures. Sometimes it's tempting to treat text structure as a fill in the blanks concept. Hand out a paragraph, find the text structure, move on to the next. But text structures are most interesting to consider when we think about how authors use the different structures to convey meaning. Always be sure to bring the focus back to making meaning. The question is not, "What's the text structure?" Instead, the question is, "How can the text structure help me to understand the text?" Trying to fold text structure into guided reading can be a daunting task. If you are short for time and preparing for state testing, it's okay to work with whole-class texts and lessons. This can take several different forms. You may want to do a shared reading with a grade level text, and then have pairs of students read leveled texts, with all students looking for the same text structure clue words and using the same graphic organizers. 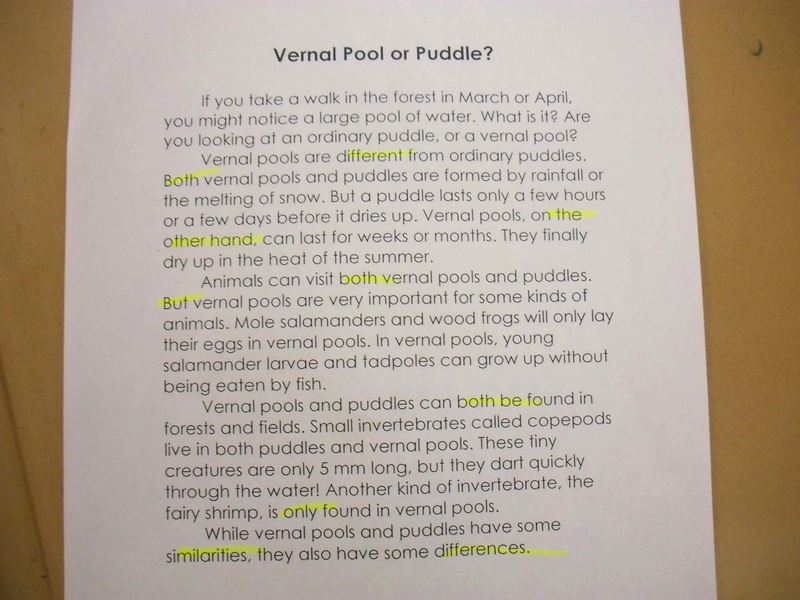 Or you may want to have all students work with grade level text. If testing is approaching, it's important for struggling readers to have some coping skills for grade level text. You can scaffold the task for them by highlighting transition words in a text or giving them a partially-completed organizer. But seeing that grade level text can help students to feel more confident ahead of the test. It can be tempting to skip writing summaries in the different text structures. However, this is an important step. You've read the texts--why not summarize? Even if you need to just make a quick choose-the-best-summary task, you'll find that taking the time to address summarizing within each text structure will help you in the long run. If you know that teachers in previous grades address text structure, it may be worth taking some time to find out how much kids already know. A carousel activity is a quick way to do this. Put each text structure on a large piece of chart paper. Hang up the charts around the room. Break up students into small groups and give each group a marker. Have them visit each chart and write down what they know about that text structure. This has the added benefit of reminding students of what they may have learned in the past. It's always funny to see those kids who claim they have never heard of text structure before challenged by their former classmates--"Mrs. X taught us that! You were there! Remember?" DO: Come back to text structures! However you decide to structure your unit, be sure to come back to text structures to pick up anything you may have missed. Being able to use and understand text structures helps readers to comprehend nonfiction text. Testing or not, text structure is an important topic to teach. Getting ready to start teaching a text structure unit? Here are some tips on how to get ready. My first step this year was to put together tabbed binders for everyone in the grade. This year, I have two new teachers on the team, plus I'm working with two co-teachers. Getting everyone the same basic materials helps to keep us all together. The tabs on the binder are simple. First, I included copies of the assessments that we'll use. Then I included the text structures that we plan to teach, in order. I like to start with the time-based structures--chronological order, cause and effect, and problem/solution--before moving onto the other structures of compare and contrast and description. Our next step was to put together our existing resources. Since I've been teaching text structure for several years, I have quite a few texts that I've gotten together. 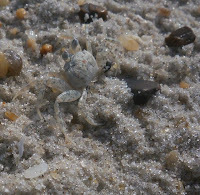 (I've also written quite a few--see the "Text Structure" tab at the top of the page for these.) We also looked at the Scholastic News from this year, issues of Click and Ask magazines, and various teacher resource books. If your state has a state testing resource site, you may find that some of these texts will work. This is a tricky question. In my grade, we just finished a month-long theme study of Antarctica. Themes can be wonderful because they provide students with opportunities to see the same ideas again and again, and help kids to build strong networks of knowledge. But the problem with themes is that they might encourage the use of less-than-optimal texts. For teaching text structure, it's best to use the highest quality texts that you can find to illustrate the text structures. Grabbing a text that's okay just because it fits into a theme may not help you in the end. I like to find a middle ground by using little themelets. For chronological order, for example, I use the "Great Chicago Fire" text from Toolkit Texts. This matches well with the cause and effect "The Boston Molasses Disaster" from Fluency Formula, as well as the "What Is a Tsunami" that I wrote. But a disaster theme can only take you so far. By the time we get to problem and solution, I'm happy to move on to animal-based texts and happier topics. While you're looking for texts, remember to look at the bookroom. We've been slowly expanding our selection of text structure texts in the past few years, adding titles like A Place for Butterflies and Shopping: Then and Now. If you don't find much, this might be a good way to decide on what to purchase in upcoming years. This is the hard part. At this point, work with your colleagues to decide which texts will be for core instruction, which for guided reading, and which for independent center or homework. For core instruction, I look for grade-level texts that are excellent examples of different text structures. My list of texts changes from year to year. While I do have some favorites, I also like to add new ones related to my students' interests. I do write some texts, especially when I can't find something that's just right. I've made a number of centers for my students as well. I've played around with making different Powerpoints (regular, easy)for introducing the structures. I like these because they are so visual. This year, I'm going to use the relevant Powerpoint slides to introduce each structure, and then work with different texts. If you are in a co-teaching situation, it's important to decide ahead of time what you want your graphic organizers to look like. Do you want to use the same ones for each structure, or do you want to expose students to different organizers? Making a common poster or guide sheet is helpful for this. As I teach different text structures, I like to have kids work with summarizing within each structure. Sometimes this is a choose-the-best-summary activity, sometimes it's a scaffolded summary, and sometimes it's a summary writing activity. I've found that this distributed approach to summarizing is highly effective. I look on teaching text structure as a fun way to help students become better readers. They usually enjoy it as well. From choosing texts to planning graphic organizers, it can be a real adventure! 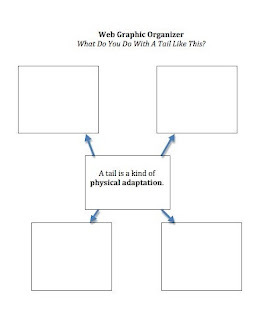 I'm starting animal adaptations this week! I love this unit because the kids get so excited to learn about animals. We start off by talking about the difference between physical and behavioral adaptations. 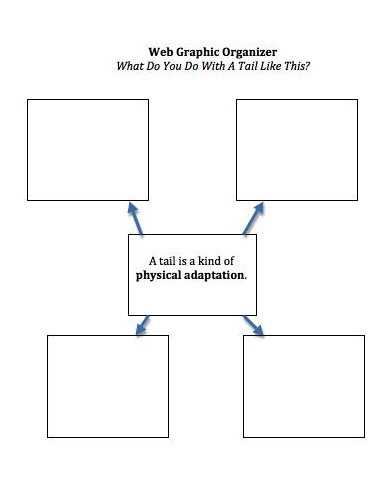 Then, we focus on physical adaptations. I love reading What Do You Do With a Tail Like This? by Steve Jenkins. In small groups, students create webs to show how different body parts are physical adaptations of animals. We also read "Swim School", an article in the Toolkit Texts 4-5 book. Action lead: The first four paragraphs of the article introduce the reader to the polar bear by showing the polar bear in action, catching a beluga whale. The sun rises above the Arctic Ocean, spreading a fiery glow over the pale ice. Across the frozen sea, a white bear lumbers. Compare and contrast: Four paragraphs in the article compare the polar bear to the brown bear. Words like difference, better suited, and but help to make the differences easy to understand, while also serving as good examples of text structure cue words in real life text. Cause and effect: Many real-life articles combine text structures. In this article, there are several examples of causes and effects both at the sentence level and the paragraph level. 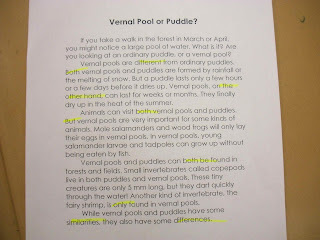 Several sentences in the compare and contrast section show why certain adaptations help the polar bear. At the end of the article, a cause and effect paragraph shows why changes in climate affect the polar bear. As I'm just about to start teaching about animal adaptations in science and text structure in reading, I'm looking forward to sharing this text with students.